The ratio of a linear trend, which is determined by the least square technique and characterizes the average rate of the climatic variable corresponding to the trend, was used as a measure of intensity of climatic changes within a specified period of time. Annual temperature of the lower layer of air is used to describe the current climatic changes. The physical sense of this climatic characteristic is determined by an almost linear dependence of longwave radiation coming from the top border of the atmosphere on the temperature of the lower air layer. Given this dependence, the assessment of the indicated temperature is largely analogous to the estimation of the average outgoing longwave radiation, which can be used to determine the speed of heating or cooling of the Earth's surface. Annual temperature trend values in 1961-2008 were positive and ranged from 0.24° to 0.52° C/10 years, which is an order of magnitude higher than similar ratios calculated on the average for the Northern Hemisphere. Maximum values of the trend are observed in the north of the study area. One of the centers is located in the Barguzinsky reserve. This area (on the northeastern coast of Lake Baikal) is also interesting, as unlike other weather stations it has the same high trends throughout the year. The majority of these locations is characterized by the annual variation of the coefficients describing the linear trend of air temperature, with a peak in February and a minimum in the summer months. July has an asymmetric distribution of trend values. Although they are all statistically significant, their maximum clearly shifts to the territory of Zabaikalsky krai. The foothills of the Khamar-Daban (the Khamar-Daban station) and the upper Lena river (the Kachug station) can be called the local areas of minimal trends during all months of the year. A quite different pattern is observed for the trends in annual precipitation. 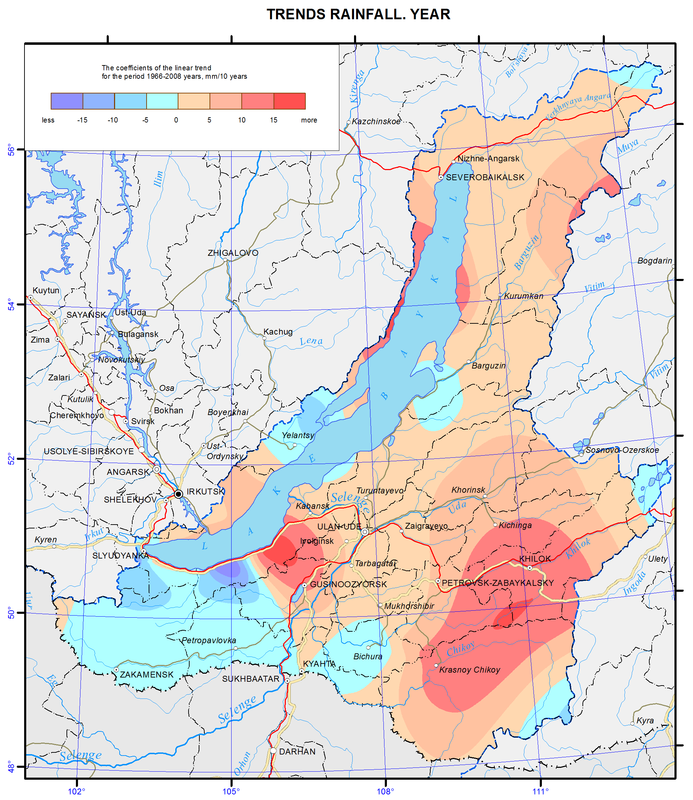 Positive trends take place approximately on the two thirds of the basin, where there are two places with maximum values exceeding 10-15 mm/10 years – in the basins of the rivers Khilok and Chikoy and in the town of Babushkin and its adjacent mountainous area. On the other hand, negative trends in precipitation with the gradient of -15 mm/ 10 years are observed in the most part of the Khamar-Daban mountain range, southern Buryatia, the Olkhon area, the coastal area of Barguzinsky Bay, and some other territories.